So the Gridlife story begins on Thursday morning when I drug myself out of bed for an early doctors appointment which ended up being 3 hours of waiting at the doctors office but at least my medical problems are getting better. Due to the long wait at the doctors office I was already almost two hours behind schedule on getting the car packed and ready for the weekend. After fitting an entire campsite , second set of wheels and all the tools needed to fix any issues that happened the car was ready to go around 1:45pm. I made my way down deeper into Metro Detroit to my friend Brian’s house where our convoy was gathering. We left for Kalamazoo to go pickup a few more cars for our convoy and I got the pleasure of watching people break their necks to look at Ryan’s GTR. We had to stop for gas outside Ann Arbor and that allowed me to get a few pictures of his car and devour Popeyes chicken. We ended up getting to gingerman around 8pm just in time to setup camp and get into the line for tech. This Red wrapped GTR was beautiful and they had just finished the car in a handful of weeks. So after falling asleep around 1230am I was awoken by rain around 4am and managed to sleep until 7am or so. I woke up to this majestic sight. First Session out at 9am I was feeling out the cars entire new suspension and was not pushing it nearly as hard as I could have. I ran a few mid 1:50 laps in traffic then came in to check up on the car. The rest of the sessions went pretty much the same with nothing out of the ordinary happening except for trains and lots of traffic preventing me from getting a clean lap in. I was having a great time though and at the end of the day settled into the campsite for a beer and some much needed sleep. Sadly that much needed sleep never happened due to some idiot doing hot laps in his cammed mini truck until 2am and another idiot blasting horrible music from his VW Passat lease that had twin 12 inch subwoofers stuffed into the poor car. Those two people with their powers combined meant that I was a very salty joey at 6am. After crawling up to the drivers meeting I was ready for my 9am session which consisted of being stuck in traffic and not really managing anything better than a 1:52 while chasing Mustangs and Brz’s around endlessly. Second session was even more traffic packed but we managed to have fun by blasting Eurobeat and working on improving my lines while in Gridlife train simulator. There were however some people who clearly had no idea where they were or what they were doing , I can remember a BMW 540i belching smoke and an Audi S3 who were all over the track. But that is typical when you have over 20 people on the track at a given time. I woke up on sunday around 7am after laying in my sleeping bag for an hour or so plotting to kill the owner of the VW Passat and the cammed mini truck due to the lack of sleep I got because of them. After the last drivers meeting I decided I was going to go for a kill lap when I got out there and was conveniently placed behind a really fast civic hatch. I pushed the car pretty hard while still braking conservatively and managed a 1:48.60 ! I was super happy and decided to just take it easy for the rest of the day as I was borderline heatstroke the entire weekend. So with my goal of a sub 1:50 achieved I skipped my last two sessions , packed up and headed home because I was exhausted. I stopped on my way back towards Kalamazoo to get a ton of water and cold beverages. Due to not having air conditioning in my car it was a wonderful 90 degrees and I was roasting. I drank over 4 liters of water during the three hour drive home which is almost how much oil my engine holds. So the car did around 600 miles round trip during the entire long weekend , had no mechanical issues and ran flawlessly. It consumed over 40 gallons of gas including some race gas. There are some things that need to be addressed but overall it was a great experience. The Power Stop track day pads were awesome and the only downside is the insane amount of dust. 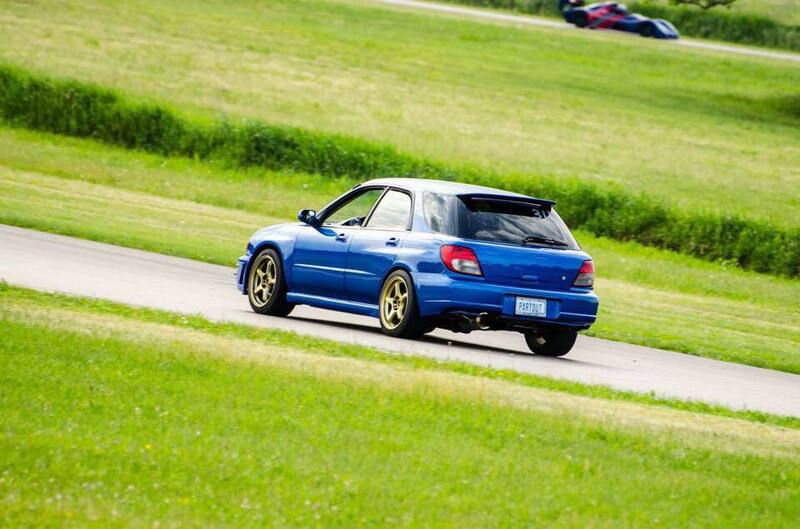 I can’t wait for my next track day at Mid Ohio in a few months.